When potential donors hit your website, the design should lead them easily to and through the donation process. Your main goal is to make the giving experience straightforward and boost the commitment level of someone who is thinking of donating. At the most basic level, you should have a clear button on your website that takes donors straight to your simple donation page. But there’s a way to help donors begin the checkout process before they even get there. Equipped with the right fundraising software, you can create a smaller, customized form on your webpage that donors can begin filling out, before they even navigate to your official donation page. This form can even include a suggested gift amount that makes it easy for donors to decide how much to give. When they hit submit, they’re taken straight to your donation page where their information has already been prepopulated. All they need to do is fill out the remaining fields, and voila! They’ve successfully completed their gift in seconds. To give you an idea of what this could look like for you, here are six examples of smaller, customized forms that organizations have created on their websites. You’ll also learn what we love about them and how to create the same thing for your website. 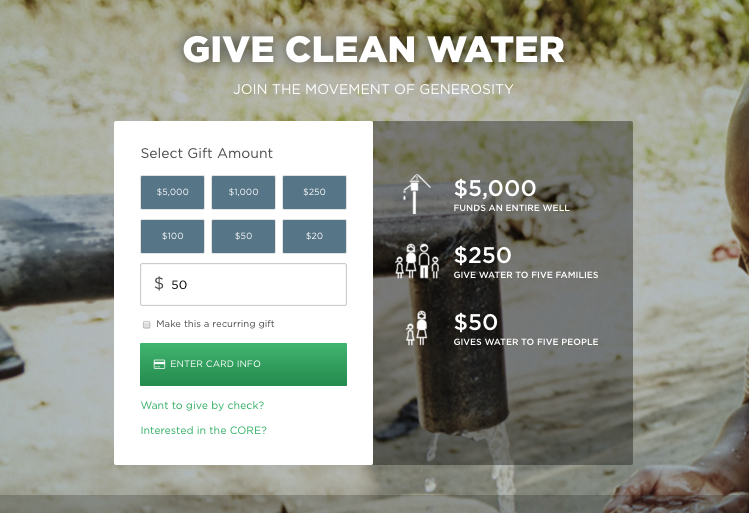 Generosity.org is committed to providing clean water to vulnerable communities. When you hit the “donate” tab on their website’s top navigation bar, you are instantly greeted by a sleek form to begin filling out a donation. This is a great form because not only can donors simply choose from a range of suggested gift amounts, they can see right there on the side what each gift size makes possible. This can inform and encourage them to commit to your preset gift levels. At the same time, a $50 amount is pre-filled on the form so that donors can just check the recurring gift option and hit “enter card info” to begin the donation process. Once a visitor hits that button, they’re taken to the donation page where their gift amount and monthly or one-time option is prepopulated. What We Love About It – By creating a smaller form on their website, the organization can leverage the extra space to communicate how each suggested gift size can make a difference. This encourages donors to go along with your preset giving levels and possibly upgrade their gift. A pre-filled gift amount can also eliminate one step from the donor’s giving process. Mercy For Animals protects farmed animals by advocating for humane food choices and policies. To encourage donations, the organization presents this small form at the bottom of every page of their website. The donation field is also prepopulated with a suggested amount—in this case, 45 dollars. Instead of mulling over how much they should give, the donor can simply go with the pre-filled amount and click either the “monthly” or “once” option right away. After hitting the recurring gift option, the supporter is taken to the donation form where the gift amount is pulled through and the “monthly” gift option is pre-checked. What We Love About It – By placing this small form on each page of their website, the organization gives the site visitor the opportunity to donate at any point while browsing the website. 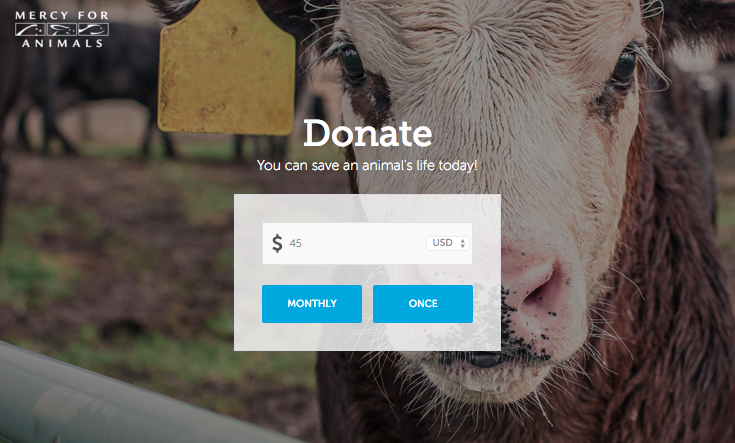 The high-quality image—in which the cow looks directly back at the user—also challenges and motivates the potential supporter to take action. 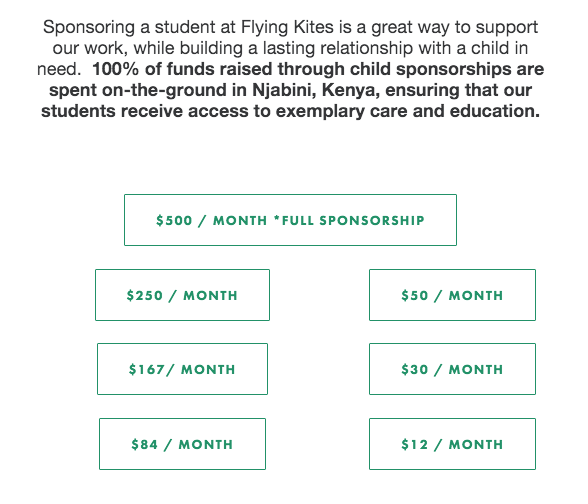 Flying Kites is an organization that empowers vulnerable children in Kenya through education and community. One of the ways supporters can get involved is by “sponsoring a student” through a recurring gift. When a visitor navigates to the “Sponsor a Student” webpage, he or she can choose from a number of suggested donation amounts. Each button leads to a customized donation page branded to the organization’s recurring giving program. The page corresponds to the gift amount chosen by the donor. What We Love About It – The various buttons create a range of suggested gift amounts that might upgrade the visitor’s average gift size. And rather than filling out actual fields, donors only have to click one button before being taken directly to a corresponding donation page. Possible delivers high-quality healthcare to vulnerable communities. 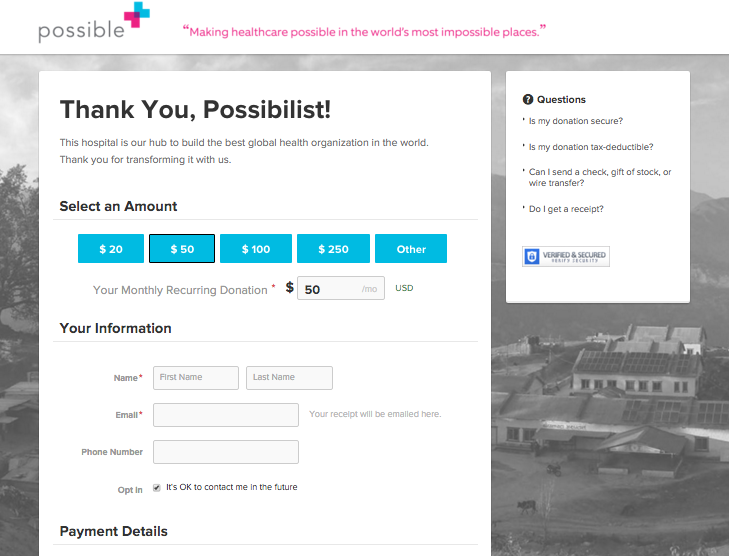 By becoming a Possibilist, a monthly funder, supporters can help build a rural teaching hospital in Nepal. When site visitors scroll through details about the organization’s recurring giving program on the website, they are presented with this simple form that encourages easy enrollment as a monthly donor. 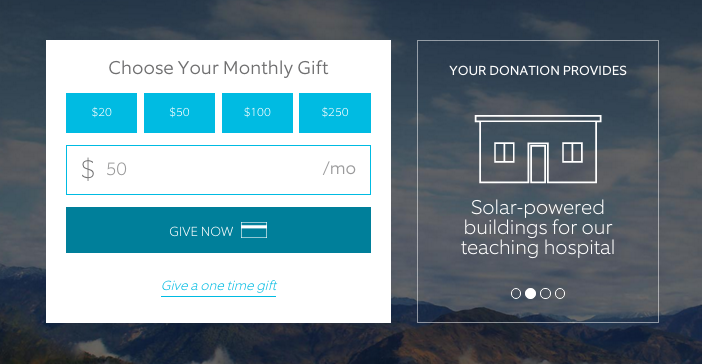 Check out the image slideshow next to the form that details what your recurring gift makes possible. After making their selection, they are taken straight to a customized donation page—branded specifically to the organization’s recurring giving program—pre-filled with their chosen gift amount. What We Love About It – The image slideshow next to the small web form, as shown above, is a great touch that connects gifts to their impact. Because it may be difficult for supporters to connect a recurring donation to its long-term impact, providing visuals—titled “Your donation provides…”—is a great way to help donors understand the power of their gift. 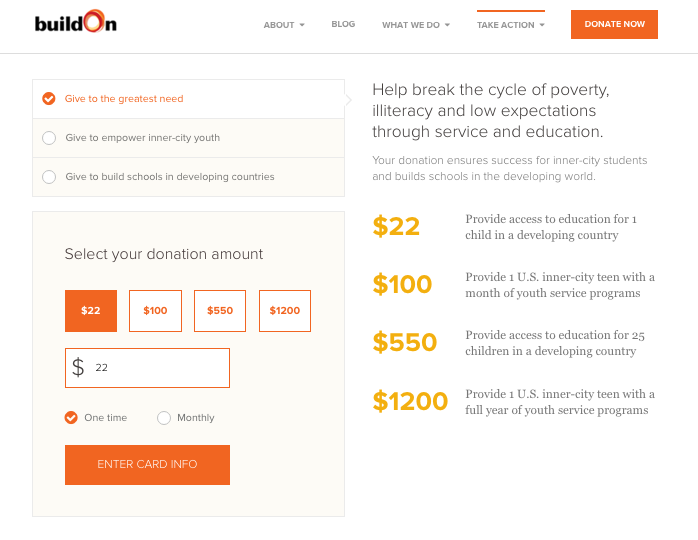 buildOn aims to break the cycle of poverty through education and community service. 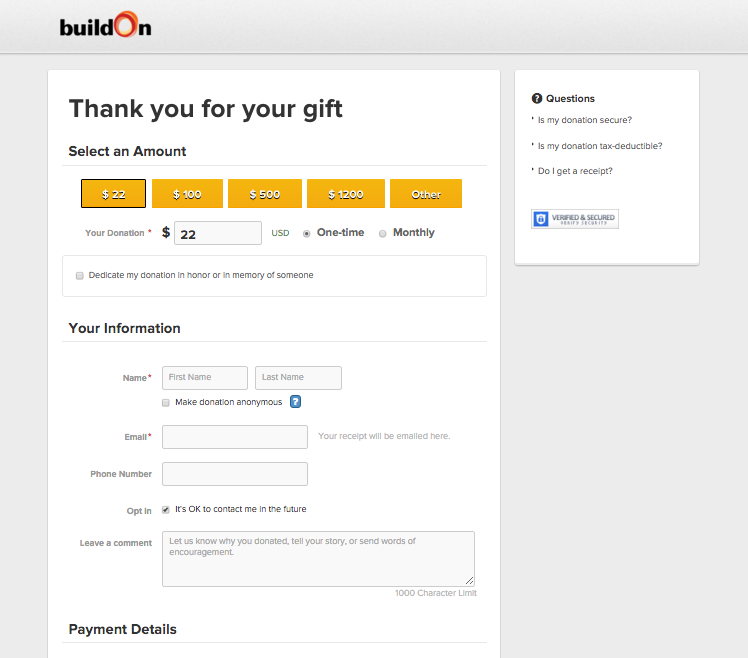 When a user hits the “Donate Now” tab in the top navigation bar of buildOn’s website, they come across this awesome form that allows donors to choose both their gift amount and which program they’d like to support. Note how they can easily select from suggested amounts after reading the potential impact of each one. Users are then directed to the official donation page to complete their gift. What We Love About It – By allowing the donor to choose which program to support—and giving details about each gift’s impact within the respective programs—the organization gives potential supporters the power of choice, while telling them exactly how each option will make a difference. This is all made possible with pass-through parameters. 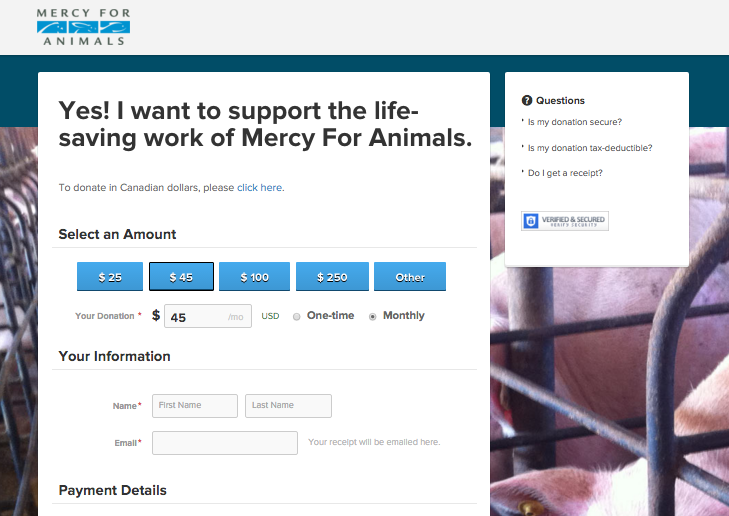 These parameters allow you to identify specific fields on a smaller form and pull them into your donation page. This information prepopulates on the donation page. Supporters essentially begin checking out before they even navigate to your donation page. Because this information prepopulates on the Classy donation page, supporters can skip over pre-filled sections and simply fill out the rest of the form. When you allow donors to start filling out their gift information right on your website, you can encourage them to commit to the entire giving process and boost overall conversion rates. This also gives you the extra real estate to tie suggested gift amounts with their tangible impact, giving potential donors the extra push to get involved. Improve your web design and leverage the right fundraising software to streamline the checkout process for your supporters.